Toile de Beautiran Guido Reni "le char de l'Aurore"
Raphael and I went on a 'date' a few months ago. It wasn't meant to be a date, it started out with me wanting to catch the incredible 'Les chafarcanis' exhibition before it closed and in my fervour I think it must have rubbed off on him. "We'll go together" he announced, "and book somewhere nice for lunch".... Gorgeous antique textiles AND lunch out - I'm there! I was blown away by the Hotel d'Agar. I went there with a fair idea of what we would see as I'd had a glorious sneak peek of the exhibition and had seen and touched many of the precious chafarcanis in my friend Moniques home when we took our French Musettes there in May. However the Hotel d'Agar is the most incredible space, and you are (on appointment) assigned a guide who talks you through the exhibitions. We were very fortunate to have Olivier Morand, the son of the founders, and a Louvre graduate, as our chaperon. I have never experienced a more intimate, personable, entertaining, charming introduction to a collection. It was pure joy! He doesn't just repeat information as much as he weaves a tale around each object. He has grown up with many of these objets d'art and his passion is contagious. One of the fab Hotel d'Agar learning experiences for me was on how to identify an authentic Indiennes toiles. In the image above you can see numbers, these are the printers 'reference numbers' which would have been made by the draftsman to assist in the archival process. 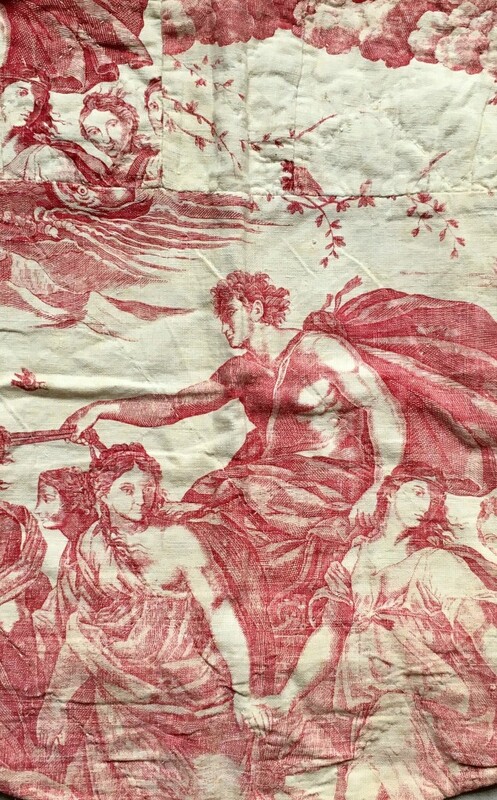 Therefore if we know the number of a certain design we can trace the original 'designer' of the toile. Hand carved wooden stamps for each toile pattern, labelled with a number which reference each particular design. This photograph shows the 'chef de pièce'. This is the stamp of the pattern printer. 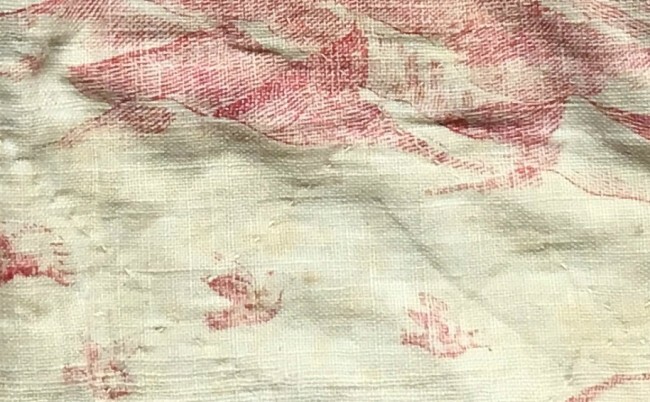 Worth noting is the distinctive 'Red band', much like a watermark or a hologram today - this is also a sign of authenticity - however it is extremely rare to find a toile today with an original red band. As this band was created with Garance (madder root) purposely without mordançage, it would have been either destroyed after the purchase (trimmed) or it would disappear after the first wash. The image above shows the original 'sales label'. It is incredibly rare to find this element still intact. According to the Hotel d'Agar, this is the only one ever found to the best of their knowledge. This summer I happened across a trunk of beautiful Toile de Nantes remnants at a brocante just outside Bordeaux. After much searching in archives and asking the advice of my textile collecting community - I discovered I found some real treasures. Sections from a very rare 1815, toile de Nantes called CINCINNATUS, created by the highly celebrated Atelier Petitpierre. Detail : quote "On annonce a Cincinnatus qu'il est elu Dictateur." Atelier Petitpierre. I also discovered another very special piece, a remnant of the rare and celebrated Toile de Beautiran inspired by Guido Reni and his work "le char de l'Aurore". It is one of the most celebrated Toile de Beautiran - inspired by Guido Reni and his work "le char de l'Aurore"
18th Century. Toile de Beautiran "le char de l'Aurore"
This particular design is one of the most celebrated designs created by Beautiran, a Bordelais Indiennes manufacturers. Copper plated print on cotton, garance dye for the beautiful red colour of the print. The motif of Char was inspired by the famous work of Guido Reni which is in the Palais Pallavicini in Rome. We can recognise the subjects of Greek Gods Apollo & Daphne in the scene. Some of the panels I found have exquisite mendings, some are so seamless that you only realise there are mends when you turn the fabric over. When a textile is cherished so... every tiny mend is a love letter.